Safe to say that they hold Konerko at third here. Moving the Needle: Carlos Quentin doubles in the go-ahead runs, +.660 WPA. Top of the ninth. Down one. Runners at the corners, and two outs. Joakim Soria dealt a fastball belt high and in to Quentin, but he jumped out ahead of it and drove it into the gap. The decision to pinch run Brent Lillibridge for Paul Konerko paid off handsomely, as the little guy chugged around third and beat the throw home. The lead wouldn’t last long, though, as Kila Ka’aihue hit an RBI double of his own in the bottom half. It wasn’t until the 12th that Brent Morel hit a bases loaded single to break the tie. In any case, Quentin also had another double and a homer on the day. Juan Pierre: 3 for 6, 1 2B, 1 R, 2 RBI, 1 SB. Notable, because 1) that’s a solid line, 2) he was the dee-freaking-h, and 3) despite the solid line, he still finished the game with -.055 WPA. Moving the Needle: B.J. Upton goes deep, +.133 WPA. Clearly, WPA has conspired to keep Jeff Mathis from gaining the top spot in this one. Maybe it’s because his sixth-inning double spent a microsecond in Matt Joyce’s mitt before falling to the turf. In any case, Upton’s shot caused the biggest shift in this one. It was, like many Upton homers, a line drive shot into the left field seats. 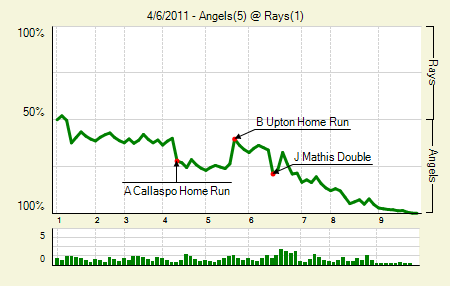 While it halved the Angels’ lead, it would be the Rays only run for the game. Dan Haren: 7.2 IP, 4 H, 1 R, 1 ER, 0 BB, 6 K, 1 HR. If he weren’t at 110 pitches I’m certain he would have stayed in to face Manny Ramirez, who came in as a pinch hitter. It was a filthy day for Haren, who really had his slider working. Jeff Mathis: 2 for 4, 2 2B. OK, I’ll say uncle. Mathis won’t have too many chances to appear in these spaces, so I might as well give him his due while there’s an opportunity. Jeremy Hellickson: 5.2 IP, 6 H, 3 R, 3 ER, 2 BB, 10 K, 1 HR. Any time there’s a 10-strikeout performance it’s notable. That’s 10 out of 17 total outs, which is even more impressive. Alas, the Angels had no problem smacking around basically all of his mistakes. 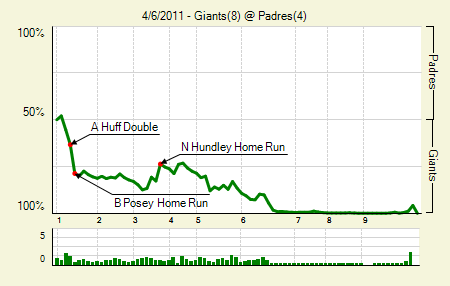 Moving the Needle: Buster Posey puts the Giants up early with a two-run homer, +.154 WPA. Some advice to any up-and-coming major leaguers who are reading this: If your fastball doesn’t top 90, you might want to choose another pitch on 3-1 to Posey. If you must go to it, make sure it’s not out over the plate. Unfortunately, this ex-post advice doesn’t do Tim Stauffer any good. He did throw that fastball out over the plate to Posey, and Posey did clear the fence to give the Giants a 3-0 lead before the Padres even got a chance to bat. Combine that with our first notable, and it’s a sure win. Tim Lincecum: 7 IP, 3 H, 1 R, 1 ER, 0 BB, 13 K, 1 HR. Just when I thought Hellickson would win the K crown for the day, Lincecum went and struck out four of the first five hitters he faced, and then another nine in the next 5.1 innings. The big lead gave Brian Wilson the opportunity to scrape of some rust, which he did in fine fashion by allowing three runs and recording only two outs. Aubrey Huff: 3 for 5, 2B. If you were watching the Giants broadcast, you might have thought he homered. But no, that was a production error. It was Posey rounding the bases, silly. Moving the Needle: Aramis Ramirez sneaks one over the wall and ties the game, +.196 WPA. The Diamondbacks jumped out to an early lead in this one, but the Cubs got back into it in the fourth. Marlon Byrd singled to lead off the inning. On Armando Galarraga’s first pitch, a fastball low and in, Ramirez took a big swing and just barely cleared the fence in left. The tie wouldn’t last long, though. The Diamondbacks rallied for three in the fifth and held on, holding off a potential rally in the eighth. Chris Young: 2 for 5, 1 2B, 1 3B. The triple involved plenty of help from the Cubs. Blunder No. 1: Byrd dived for the liner with no one remotely backing him up. Blunder No. 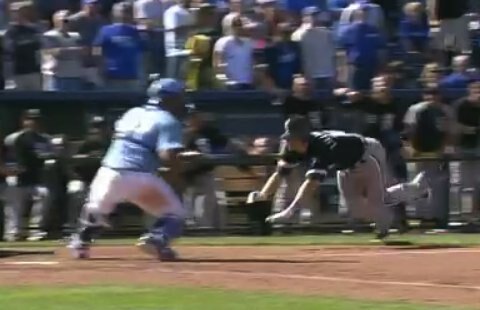 2: Alfonso Soriano fumbled with the ball when he got to it. Blunder No. 3: He made a horrible throw that got past everyone. They credited Young with a triple, but he scored on the play. He also made two outstanding plays in center. Willie Bloomquist: 2 for 5, 1 SB, 2 R, 1 RBI. As I said yesterday, Bloomquist is doing a great job of fooling Arizonans into thinking he’s actually a useful player. We know he’ll revert to his normal self soon enough, but he’s definitely helped the team along in its first few games. Moving the Needle: Todd Helton hits high, and high, and just far enough to touch ’em all, +.175 WPA. Taking a page from Larry’s book, I took a stopwatch to Helton’s blast. It hung up there only 6.1 seconds, though it seemed much longer. 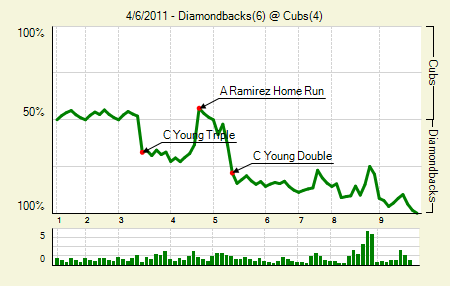 That came in the fourth, a half inning after the Dodgers had rallied for three. Helton put the Rockies back on top, this time for good. Troy Tulowitzki: 2 for 4, 1 HR. 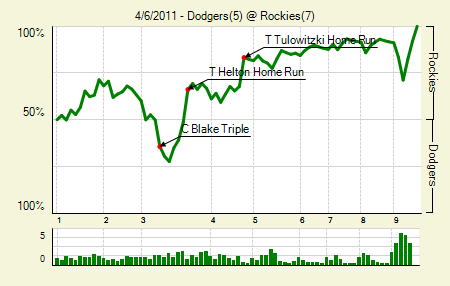 It wasn’t the prettiest of swings, but Tulowitzki still drilled it about a dozen rows deep in the left field stands. Franklin Morales: 2 IP, 1 H, 0 R, 0 BB, 2 K. It really should have been three strikeouts. It appeared that Rod Barajas had swung and missed at strike three, but it was ruled a foul tip. Then he got a break when the first base ump said he checked hi swing. It seemed as though one of those calls should have gone Morales’s way. Casey Blake: 2 for 3, 1 3B, 1 HBP. Yes, this was Blake’s 2011 debut, and yes, that’s a triple. He was a floating liner into the gap in right center. 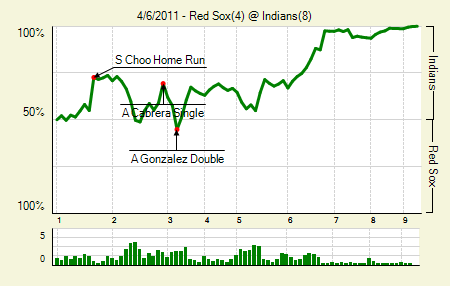 Moving the Needle: Mitch Moreland breaks the tie, +.179 WPA. Yesterday this All-Joyer made the notables section, but today he jumps into the main event with his go-ahead double. Felix Hernandez dealt him a 3-2 breaking ball and Moreland hit a bounding ball past a diving Smoak and into right field, plating the go-ahead run. An inning later the Rangers would get some insurance and secure their second straight series sweep. Jack Cust: 2 for 4, 1 R, 1 RBI. Cust tied the game with an RBI single an inning before Moreland went and screwed things up. Jack Wilson: 0 for 1, 2 E. The batting line is there for uniformity. He’s here because of the two errors, which came on back-to-back plays with the bases loaded. On the first he couldn’t handle the throw from Chone Figgins, leaving all hands safe. Coulda been a double play, coulda ended the inning. Then, on the next play he received the throw from Brenan Ryan just fine, but he threw way off line to first. That bungled another double play and allowed an additional run to score. That’s three runs total. Eric Wedge pulled him from the game afterward. Moving the Needle: Travis Snider channels the power of his mustache and socks a three-run bomb, +.285 WPA. 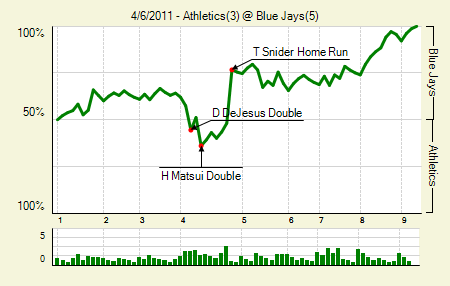 The lesson: don’t throw Travis Snider a sloppy cutter up and away. He will simply pulverize it. The three-run homer was his first of the year, though likely first of many. While baseball doesn’t lend itself well to certainty, I’m fairly sure that Snider is going to break out in a big way this year. Yunel Escobar: 3 for 3, 1 3B. Unfortunately, no one drove him in. Still, nice follow-up to his walk-off homer on Tuesday. Adam Lind: 2 for 4, 2 2B. Both off the lefty Dallas Braden, no less. He needs a big season, so it’s encouraging that he’s started hot. With that line he’s now 8 for 17 with two doubles and a homer. He still hasn’t drawn a walk, though. 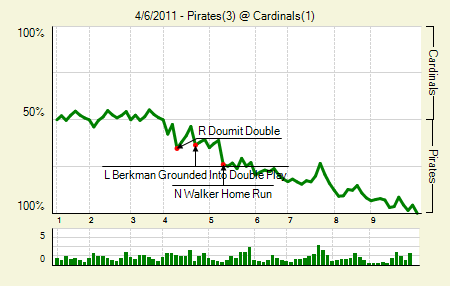 Moving the Needle: Neil Walker homers and Ryan Doumit doubles, +.129 WPA each. Well now, a rare tie atop the WPA chart. Doumit got things started by doubling home Lyle Overbay in the fourth. Lance Berkman, surprise surprise, had a little trouble coming up with the ball in right. Then in the fifth Walker continued his impressive start by hammering a Chris Carpenter fastball down the line and over the fence for a solo homer. It was a decent location, up and in, but Walker just turned on it. Seems he can do little wrong these days. Pedro Alvarez: 2 for 5, 1 2B. After the glacial pace he’s set this season, this is certainly notable. The double was his first extra base hit of 2011. Kevin Correia: 7 IP, 5 H, 0 R, 2 BB, 3 K, 9/11 GB/FB. That’s definitely one of the uglier seven-inning shutouts you’ll see. 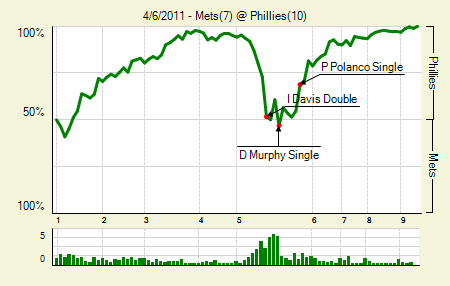 Moving the Needle: Ike Davis makes it a game, +.214 WPA. 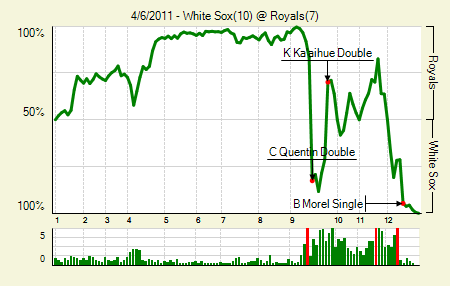 When Mike Pelfrey exited, it didn’t appear that this amount to much of a game. Not only did he put his team in a 4-0 hole, but he left the bullpen with the bases loaded. Taylor Buchholz took care of that, though, allowing a two-RBI single to the bleeping pitcher. But then in the fifth the Mets did some clobbering of their own, stringing together three singles after a double and a walk. That plated two and left the bases loaded for Davis. Two batters later, with the bases again loaded, Daniel Murphy actually tied the game. That would end the scoring for the Mets. Unfortunately for them, the Phillies still had some offense left in the tank. Placido Polanco: 3 for 5, 3 RBI. The biggest of his 3 RBI came in the fifth, just after the Mets mounted their comeback. With a runner on second and two outs he sliced one to the opposite field. Carlos Beltran laid out for it, but just couldn’t make the play. For the Phillies it was easily the biggest hit of the game. Ryan Howard: 4 for 4, 2 2B, 1 HR. Biggest contribution to the win? Hands down, I say. WPA agrees. Starting Pitching: 6.1 IP, 18 H, 14 R, 13 ER, 3 BB, 7 K, 2 HR. No sir, I don’t like it. Moving the Needle: John Buck clears the bases with a game-tying triple, +.329 WPA. Most games, it seems, have a peak WPA swing in the mid .100s. That makes me appreciate swings like this so much more. John Buck came up in a huge spot in the bottom of the fifth, bases loaded and two outs, down by three. Livan Hernandez dealt him a fastball outside, and Buck crushed it into right-center. It looked like a homer live, but the umps used that fancy replay technology to confirm that no, the ball stayed in the park by the thinnest hair. 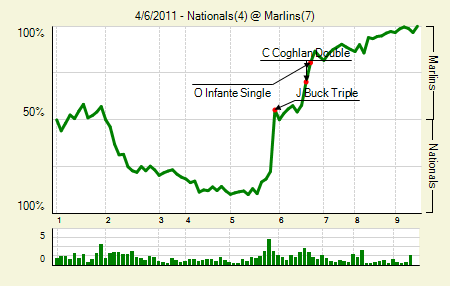 Still, that capped the Marlins’ comeback four-run fifth and set up their eventual conquest. Ian Desmond: 4 for 5, 2 2B. OK, he really doesn’t belong in the leadoff role. Good news: it worked out for one more day. Bad news: good results from a bad process usually leads to a continuation of said process. Chris Coghlan: 4 for 5, 3 2B. Chris Coghlan is unimpressed by Ian Desmond. Matt LaPorta: 2 for 3, 1 HR, 1 HBP. It was his first extra base hit of the year, and he doubled his hit total. Mitch Talbot: 4.1 IP, 5 H, 2 R, 2 ER, 3 BB, 7 K, 0 HR. Just wanted to note that using 102 pitches to record 13 outs is not good, no matter how few runs and how many strikeouts. Tasking a second division bullpen with recording more than half the game’s outs will fail more times than it succeeds. Adrian Gonzalez: 2 for 3, 1 2B, 1 HR, 1 BB. That, along with Carl Crawford’s 2 for 3 (1 BB, 2 SB) night were bright spots amid murkiness. Moving the Needle: Alex Avila doubles and then homers, +.341 WPA. At some point a team was going to stop Buck Showalter’s evil powerhouse on its quest for 162 wins. That ended up being the Tigers — nay, Avila himself, whose dominance of Brad Bergesen played an enormous part in the Tigers win. In another park, it might have been two homers, too. 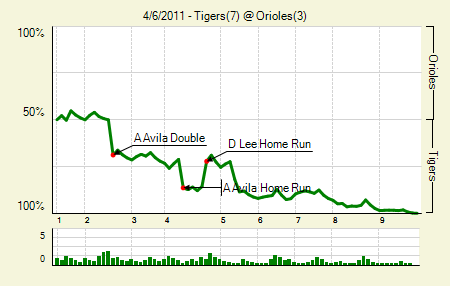 In the second, with runners on the corners and two outs, Avila crushed off the tall wall in right. No big honkin’ scoreboard, no stranded Avila. Two innings later he was better adjusted, and so made sure he hit it over that wall. Smart guy, that Avila. He added yet another RBI — off a lefty, just for good measure — in the eighth. Derrek Lee: 1 for 4, 1 HR. After looking generally terrible in the first four games, Lee finally made some noise. The ball didn’t quite make it to Eutaw Street, but it was good enough for his first bomb of the season. Victor Martinez: 3 for 5, 1 2B, 1 HR. He went back-to-back and belly-to-belly with Miguel Cabrera in the fifth to extend the Tigers lead. Justin Verlander: 8 IP, 4 H, 3 R, 3 ER, 2 BB, 9 K, 1 HR. In each of his first two starts he’s had one homer kinda mess with an otherwise excellent performance. 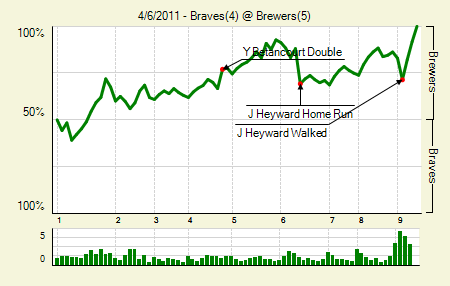 Moving the Needle: Jason Heyward puts the Braves back in it with a three-run homer, +.188 WPA. This is the second All-Joyer to make the biggest wave for his team on Wednesday. If you need a reminder of why he’s on Carson’s squad, just watch a Heyward home run swing. It’s more of a snap than a swing. One second Heyward has his hands behind his head, the next he has the bat in front of him and the ball is headed towards the seats in right. This particular instance drove in three runs. Problem was, the deficit was four. The Braves never made up that final run. Prince Fielder: 3 for 4. That’s three singles, but 3 RBI. Chipper Jones and Yuniesky Betancourt: both 2 for 4, 1 2B. This might be the only time to see these two players juxtaposed. Moving the Needle: Scott Rolen starts a rally with a two-run double, +.156 WPA. This game featured a lit of little WPA movements. 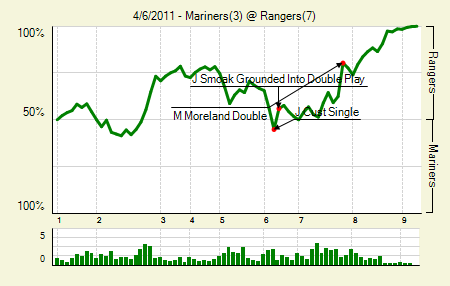 For instance, the Astros picked up four runs in the first, but no play moved the needle more than .143. 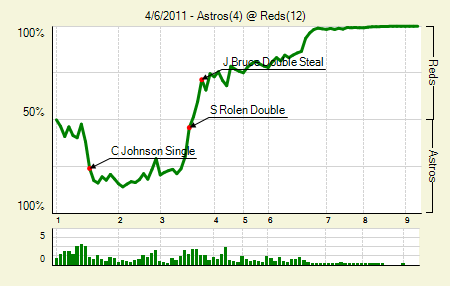 In the third the Reds mounted their comeback, which led to the biggest swing, Rolen’s double. It was a crush job into the left-center gap, plating both Brandon Phillips and Joey Votto. Rolen himself scored after a single and an error, which tied the game at four. The Reds would add another pair that inning, giving them all they’d need to fend off the still winless Astros. Logan Ondrusek, Bill Bray, Aroldis Chapman, and Francisco Cordero: 4 IP, 2 H, 0 R, 1 BB, 4 K. Picking up for Edinson Volquez, who actually settled down nicely after a three-walk, four-hit, four-run first. But those types of innings run up the pitch count, and Volquez was at 99 after five. Nelson Figueroa: 5.1 IP, 11 H, 10 R, 6 ER, 1 BB, 2 K, 0 HR. He actually retired seven straight after he allowed the sixth run to score. That might have fooled Brad Mills into leaving him in for the sixth. He did get the first guy there, but then the Reds went to work on him. Nelson Figueroa, again: 2 for 3. The only Astro with multiple hits on the night. We hoped you liked reading The Morning After: Games of April 6th by Joe Pawlikowski! Why so hard on Konerko? I’m pretty sure that if he had been on third when Quentin doubled, he still could have beaten the throw home. And if Pena drops the ball.